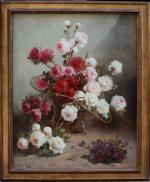 Nice Belle Epoque painting with roses in a basket was executed in the end of 19th century by famous Belgian still life and animal artist Henry Schouten (1864 Indonesia - 1927 Ghent). 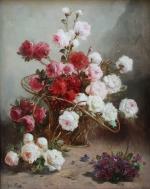 The artist was popular for his animal paintings (poultry, sheeps, cows, dogs), landscapes and still lifes. 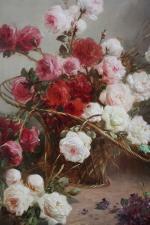 His flower works are very rare in the art market. Our painting signed with one of proofed artist´s pseunonyms and idue to the style, quality and motive is typical flower work by this artist. 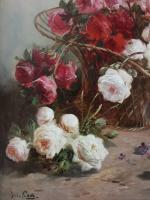 It’s proven that H. Schouten used for commercial reasons several pseudonyms especial by his still lifes (see mongraphy "H. Schouten" by P.V.Berko, artprice date bank, artnet date bank (No. 15, 23,24)). Literature: Thieme/Becker "Lexicon of artists from antique to contemporary", Leipzig, 1999. 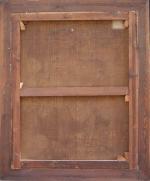 Inscription: signed with the artist‘s proven pseudonym "Jos. Klaus" lower left.